Dendritic spines appear and disappear in an experience-dependent manner. 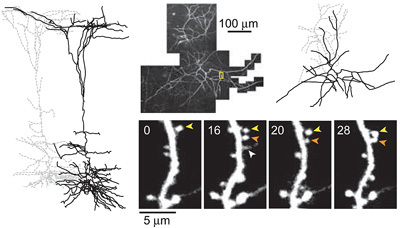 Although some new spines have been shown to contain synapses, little is known about the relationship between spine addition and synapse formation, the relative time course of these events, or whether they are coupled to de novo growth of axonal boutons. We imaged dendrites in barrel cortex of adult mice over 1 month, tracking gains and losses of spines. Using serial section electron microscopy, we analyzed the ultrastructure of spines and associated boutons. Spines reconstructed shortly after they appeared often lacked synapses, whereas spines that persisted for 4 d or more always had synapses. New spines had a large surface-to-volume ratio and preferentially contacted boutons with other synapses. In some instances, two new spines contacted the same axon. 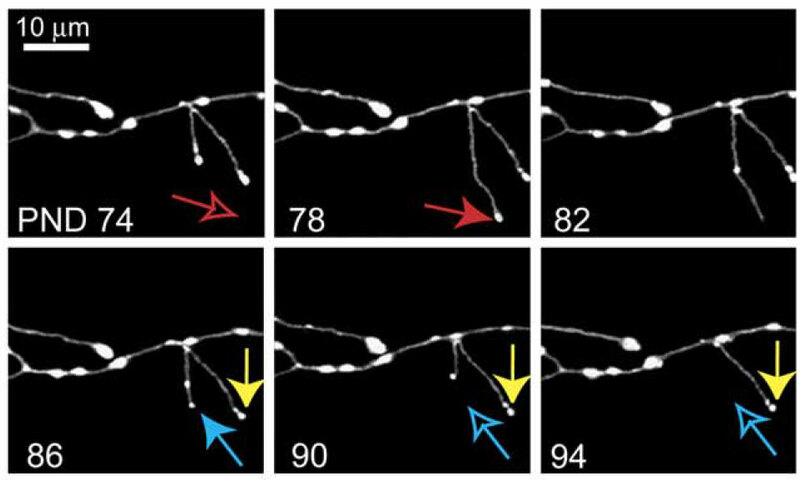 Our data show that spine growth precedes synapse formation and that new synapses form preferentially onto existing boutons. Functional circuits in the adult neocortex adjust to novel sensory experience, but the underlying synaptic mechanisms remain unknown. Growth and retraction of dendritic spines with synapse formation and elimination could change brain circuits. In the apical tufts of layer 5B (L5B) pyramidal neurons in the mouse barrel cortex, a subset of dendritic spines appear and disappear over days, whereas most spines are persistent for months. Under baseline conditions, new spines are mostly transient and rarely survive for more than a week. 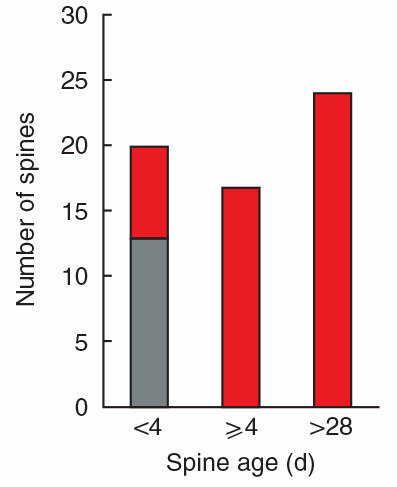 Transient spines tend to be small, whereas persistent spines are usually large. Because most excitatory synapses in the cortex occur on spines, and because synapse size10 and the number of α-amino-3-hydroxy-5-methyl-4-isoxazole propionic acid (AMPA) receptors are proportional to spine volume, the excitation of pyramidal neurons is probably driven through synapses on persistent spines. Here we test whether the generation and loss of persistent spines are enhanced by novel sensory experience. We repeatedly imaged dendritic spines for one month after trimming alternate whiskers, a paradigm that induces adaptive functional changes in neocortical circuits. Whisker trimming stabilized new spines and destabilized previously persistent spines. New-persistent spines always formed synapses. They were preferentially added on L5B neurons with complex apical tufts rather than simple tufts. Our data indicate that novel sensory experience drives the stabilization of new spines on subclasses of cortical neurons. These synaptic changes probably underlie experience-dependent remodelling of specific neocortical circuits. 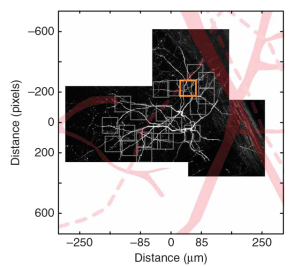 We imaged axons in layer (L) 1 of the mouse barrel cortex in vivo. Axons from thalamus and L2/3/5, or L6 pyramidal cells were identified based on their distinct morphologies. Their branching patterns and sizes were stable over times of months. 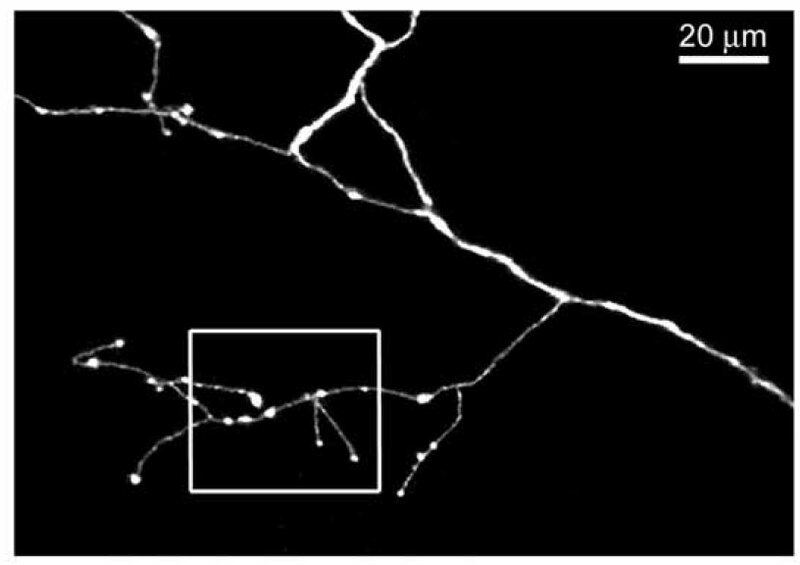 However, axonal branches and boutons displayed cell type-specific rearrangements. Structural plasticity in thalamocortical afferents was mostly due to elongation and retraction of branches (range, 1-150 microm over 4 days; approximately 5% of total axonal length), while the majority of boutons persisted for up to 9 months (persistence over 1 month approximately 85%). In contrast, L6 axon terminaux boutons were highly plastic (persistence over 1 month approximately 40 %), and other intracortical axon boutons showed intermediate levels of plasticity. Retrospective electron microscopy revealed that new boutons make synapses. Our data suggest that structural plasticity of axonal branches and boutons contributes to the remodeling of specific functional circuits.